The bulk of the materials all arrived together early on a wednesday morning. Three pallets were craned from a truck and just left outside in the street. Fortunately, it didn’t rain that day (It poured every other day that week), as it took me and my partner, Chas, all day (from 9am to 6pm) to carry it inside. At the bottom of this huge pile in the front room are the four new fire doors. On top of those are stacked 85 sheets of 12.5mm high density acoustic barrier plasterboard. 14 sheets (12 x 12.5mm and 6 x 15mm) of MDF are stacked as high as we could lift them. 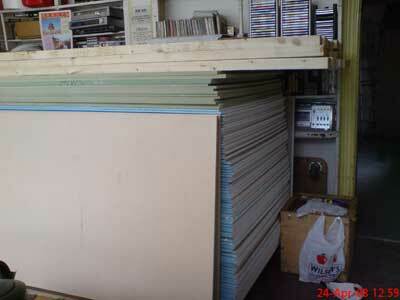 The remaining 4 sheets of 15mm MDF had to be stacked at the side as they were too heavy. 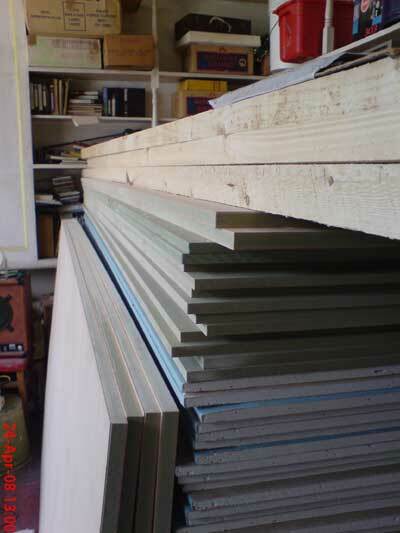 Some of the 4″x2″ Timber (the shorter lengths) top off this pile. Running out of room at the front, we then have to stack the remaining 4″x2″ timber (the 14 foot lengths) and skirting timber down the hall and into the studio area itself. 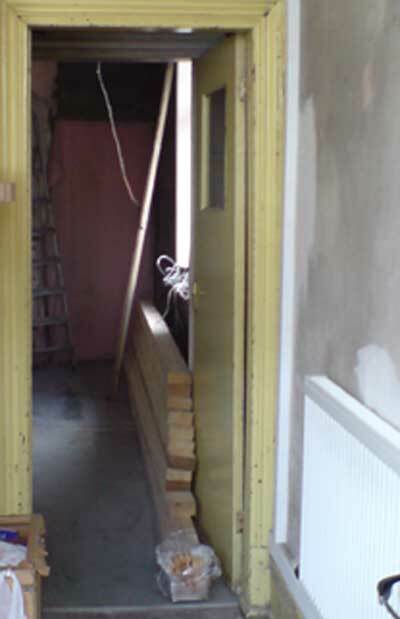 As this timber is longer than one room, the door will not be able to close for the next 9 months. 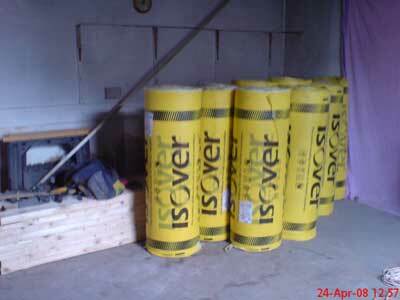 This, of course, doesn’t help to stop the dust and debris from permeating the rest of the house! As work continues over the following months, the materials in the new studio have to be moved around in order to get to the parts that we are working on. This all helps to make the job a little more inconvenient and time consuming, but space in this house, as you can see, is minimal, especially considering that we have to live here as well! This is not the only delivery. Other materials, such as plaster, paint, floor coverings, hardware, etc, will be ordered over the coming months as required. Looking at over two tons of materials just for one room seems exessive, but as you will see in the following instalments, there won’t be too much left over!